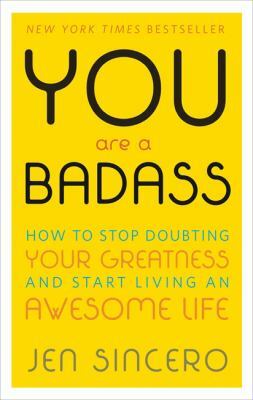 You are a badass : how to stop doubting your greatness and start living an awesome life is a wonderfully irreverent approach to self-help books. Sincero speaks from personal experience and gives encouragement as well as a 'slap in the face' advice. This book helps you realize through the annoying in-your-face bluntness that all the junk is your life is from YOU. Issues we all have with money, career, religion, relationships, procrastination and the self-sabotaging beliefs that go along with are debunked. There are concrete how-to's in short chapters to help you make real changes in your daily thought patterns and behaviors in order to become your best badass self. This book is very blunt and I appreciate that forthcoming style, especially in a self-help book. I usually need a smack in the head to get myself changing and Sincero delivers this completely. It's totally in my power to change my thinking and my circumstances and this book gives some examples of how to overcome these obstacles. One of her directives is to meditate- one powerful tool that I'm familiar with, but have been severely slacking on lately. None of her approaches are revolutionary, but she has a life coach tone that helps you feel motivated. The audiobook is a good option to really feel like you're getting personal life coaching. As the title suggests, there is colorful language throughout.